Huge Savings Item! 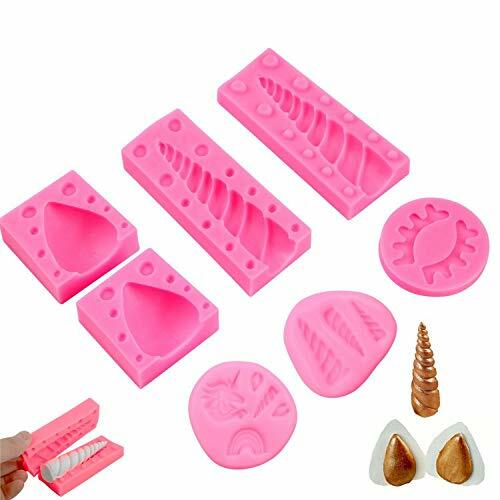 Save 17% on the Unicorn Molds,Birthday Small Cake Silicone Mould Bonus With Mini Unicorn Fondant Candy Making Mold,Unicorn Horn ear Eyelash Baking Cupcake Topper Kit(Set of 7) by Amaoz at My Beautiful Cake. Hurry! Limited time offer. Offer valid only while supplies last. That's fun to DIY with your kids or family to mold Unicorn fondant chocolate candy and decorating cakes,cupcake topper,cake pops,cookies,jelly,etc. That's fun to DIY with your kids or family to mold Unicorn fondant chocolate candy and decorating cakes,cupcake topper,cake pops,cookies,jelly,etc. These unicorn horn mold is made of 100% premium food grade silicone (easy release and clean). Package included: 1 pair of Unicorn horn mold, 1 pairs of Ears mold,1pcs Eyelash mold. 1 pairs of mini unicorn cupcake topper candy mold. 2.Be making with high-quality silicone material.Through the FDA and SGS testing. 3.temperature range: -40 to 220 degrees Celsius. Unicorn horns mold - 4"*1.6"*1.4"
Unicorn ears mold - 2"*2"*1.2"
SAFE MATERIAL -Unicorn Silicone Fondant Mold Made by Food Grade Silicone, tasteless, non-toxic, heat-resistant, durable nonstick and easy-cleaning. WHAT YOU GET: 1 pair of Unicorn horn mold, 1 pairs of Ears mold,1pcs Eyelash mold.Bonus With 1 pairs of mini candy mold. 100% MONEY BACK GARANTEE - Quality guarantee and 5-star customer service. If you are not 100% completely satisfied with your Banners, simply let us know and you will be offered a FULL refund or replacement. If you have any questions about this product by Amaoz, contact us by completing and submitting the form below. If you are looking for a specif part number, please include it with your message.